I am a lousy meat cook. First of all, I’m not much of a meat-eater so it’s hard to get enthusiastic about the topic. Second, I think that Americans have been eating too much meat for generations. My preference is to use meat as a condiment and its stock as a base, stretching good quality ingredients while maintaining nutrition and flavor. No surprise then that most of my successful meat dishes are slow-cooked. That said, however, I have discovered a few quick ways of cooking meat, in this case pork (or alternatively, chicken). This particular dish is simple but (potentially) elegant, quick (under 30 minutes) and nearly foolproof (if you don’t overcook it). It uses pork loin, not the least expensive cut by any means, but I feed four amply with ¾ pound, which amounts to under $5.00 for the meat at full price. Not bad for elegant. The more costly ingredients are the organic bell peppers, that is, if you pay full price. Our local all-organic produce market places slightly marred peppers in the markdown bin, so at 69 cents per pound, they can be a (relative) bargain. When I get a haul of great peppers, this is one of the dishes I like to make. The pork is sprinkled with paprika and slightly seared to seal in the juices. In goes a little white wine to deglaze the pan and then a little chicken stock. Sliced peppers and onions and a little thyme (fresh or dried) are mounded on top and allowed to simmer, covered, for about 20 minutes until the vegetables are crisp tender and the pork cooked through but slightly pink. The pork is removed to a warm platter to rest while a little sour cream or yogurt is added to the vegetables and cooked for a couple of minutes into a beautiful sauce. That’s it. Simplicity. You can serve this on noodles or potatoes. I don’t know where I got the idea for this dish since I’ve been making it for so long, but I suspect it was from Pierre Franey’s New York Times series on quick meals. Dry the pork loin. Cut it in half if necessary to fit the pan. Coat it with sweet paprika and a sprinkling of salt. Saute it slowly in vegetable oil to sear all sides. Add the white wine to deglaze the pan, and then the chicken stock. Pile the vegetables and thyme on top, bring the liquid to a simmer, cover the pan, and cook over low heat for about 20 minutes, or until the vegetables are crisp-tender and the meat is cooked but still slightly pink (it will continue to cook after being removed from the pan). Remove the pork to a plate and keep warm. Bring the liquid to a near boil, and add in the sour cream. (You can warm the sour cream with a little liquid before adding it to the pan to avoid curdling; this is more important when using yogurt than with sour cream.) 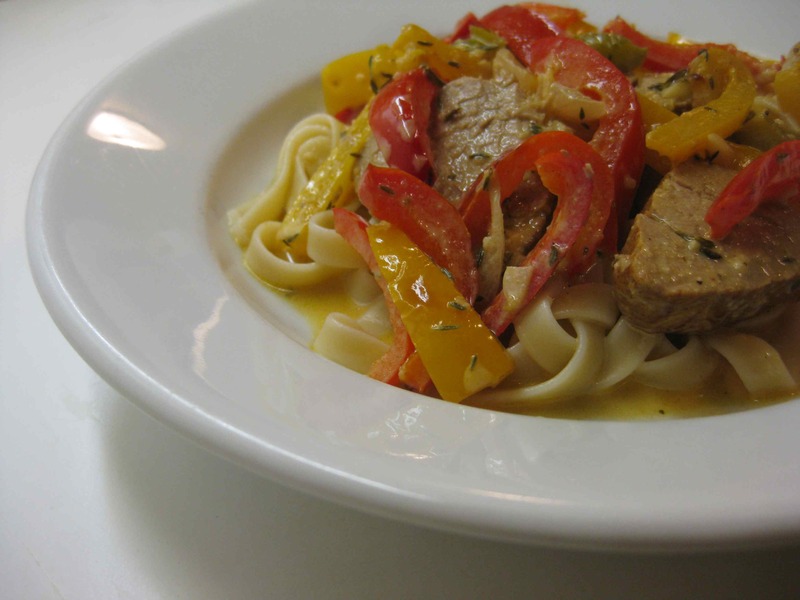 Carve the pork into thin slices and top with the vegetables and cooking liquid. Spoon over noodles or potatoes. Serves 4.